Due to a long, slender, and legless body, some lizards closely look like snakes. The major difference between these lizards and snakes is that they have eyelids and ear holes. With their long, legless and polished bodies, mimic glass lizards (Ophisaurus mimicus) can be confused with snakes. They are slender and range between 15 and 26 inches in length. Their flexible eyelids, ear openings and fixed jawbones make them different from snakes. These lizards are yellow and brown, with dark stripes. They mainly prefer to live in dry areas, and can break off their tails to evade predators. Owing to their long, legless and shiny bodies, Eastern glass lizards (Ophisaurus ventralis) superficially resemble snakes. They vary from snakes in that they have visible ear openings, flexible eyelids and fixed jawbones. They are light brown and develop a greenish coloration as they get older. They prefer sandy habitats and wetlands, especially coastal areas. They too can break off their tails to escape from predators. Island glass lizards (Ophisaurus compressus) are found along coasts and islands, as the name suggests. They too possess noticeable ear openings, movable eyelids and fixed jawbones. The island lizard mainly lives in dry sandy habitats and hide under debris. They feed on insects, spiders and invertebrates due to their rigid jaws, which cannot accommodate larger organisms. The California legless lizard (Anniella pulchra) is a legless smooth-scaled lizard. It has a blunt tail and movable eyelids, unlike snakes, with a dark-brown dorsal coloration and bright-yellow ventral coloring. These snakes mostly live underground because they cannot tolerate direct sunlight. The lizards detach their tails to evade predators such as snakes and domestic cats. They feed on insect larvae and prefer dry habitats. 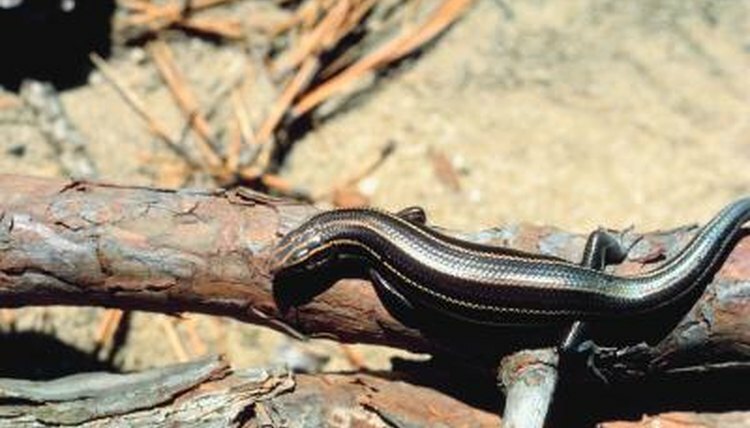 Slender glass lizards (Ophisaurus attenuatus) have dark longitudinal stripes on their sides and lack legs. They have moveable eyelids and noticeable ear openings that distinguish them from snakes. Glass lizards are common in sand prairies and arid woodlands. They mainly consume invertebrates and other smaller lizards, and are mainly hunted by hawks. Like other members of the Ophisaurus genus, they can easily break off their tails to escape predators.